You have some lovely ideas for Autumn/Winter sewing and I look forward to seeing your finished garments. Unlike you, I feel the cold and tend to make warmer garments. I have finished a Japanese apron dress (blogged) and Japanese bolero cardigan (to be blogged). I plan to make more Japanese style garments and to use lightweight corduroy fabrics for Autumn/Winter. I do like Japanese styles, not sure they suit me though! I love your selection of autumn makes. I’ve just bought your second choice of Ikat from Offset warehouse – dark blue with flecks and it is absolutely beautiful! I wanted to start buying ethically sound fabric and I was totally bowled over by its texture, weight and colour. I think it would be lovely for trousers, mine is probably going to be for a Merchant and Mills Camber shift for a go-to everyday dress. I think I’ll invest in it soon. It’s so easy to buy ethical when they’re so gorgeous, and really quite affordable. Hey! I’m actually making the Esther top this weekend, in plain natural linen. So far so good, I’ll try and give it a post when I’m done. I tend to be busier in the autumn, and it’s still very hot, so by the time I have a concentrated time to sew, it will be November! But I too would love to make an in between coat. Tough to decide on fabric, though. Your new fabrics look and sound amazing, I’m sure they will be a joy to sew! Look forward to seeing it! I made mine this weekend, turned out great. I love the look of those fabrics you got, I’ll need to check that shop out some time! Your plans sound great and have spurred me on to start thinking about Autumn sewing. I guess it’s time to stop burying my head in the sand and admit autumn is on the way, boo! Luckily my work and play wardrobes are one and the same, but I really love that grab and go idea! I like your plans. Those fabrics look lovely. My daughter lives close to Broadway Market but I missed this shop when I was down 2 weeks ago – but maybe that was too early anyway. I’ll let her know about it – she’s a brand new sewer; I just took her a sewing machine when I was down. Yes it would not have launched yet, but do pay a visit next time! By the way which Burda pattern is the grey coat in the photograph on the left? It’s gorgeous. It’s called Rosa, here’s a link – http://www.burdastyle.com/pattern_store/patterns/vintage-rosa-jacket – it might be the one, it’s sooo pretty. I’m so in love with the coat/cardigans you’ve been pinning lately! I just wish there were more sewing patterns for that silhouette – tons of RTW, but patterns don’t seem to have caught up yet! I need to pick a coat and get sewing! None are quite perfect! It’s a great habit to get into I think. Hopefully you can swing by Fabrications when you’re in the UK soon. Ha ha, definitely keen to set realistic goals since sewing time is at an all time low right now. But there’s something to be said for spontaneity and fun too! Aaah planning! So much pleasure! Nice ideas, and a lovely fabric resource to read about. It was nice to commit it all ‘to paper’ so I can refer back and keep on track! 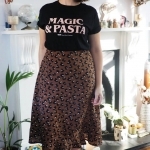 I love your capsule wardrobe ideas, until recently i just made things not even thinking about what they would go with and when i would wear them. I am now trying to plan a little more sensibly and have a few autum/winter makes planned! 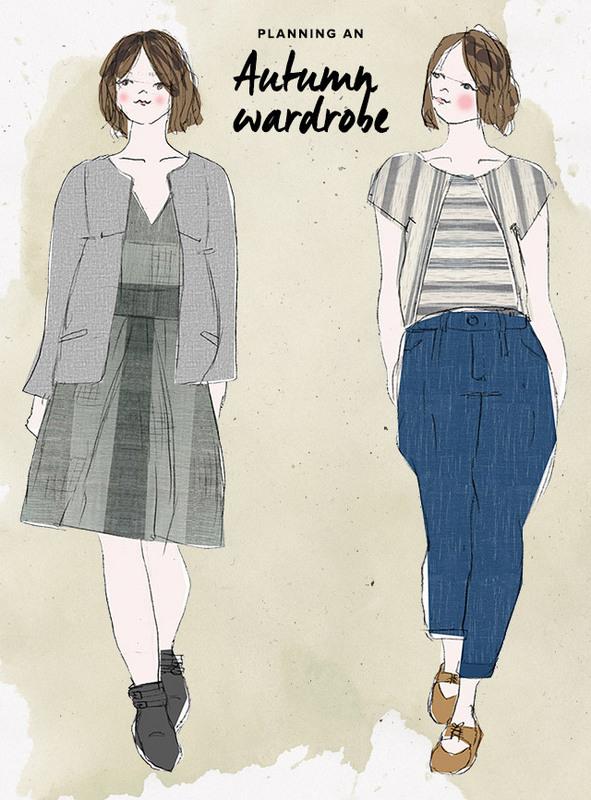 I think building a good wardrobe is just as much a learning curve as sewing skills! Thanks so much :) hope you make it to the shop sometime! That coat looks like it’s going to be spectacular! I’ve been needing a coat for just that sort of in-between weather. 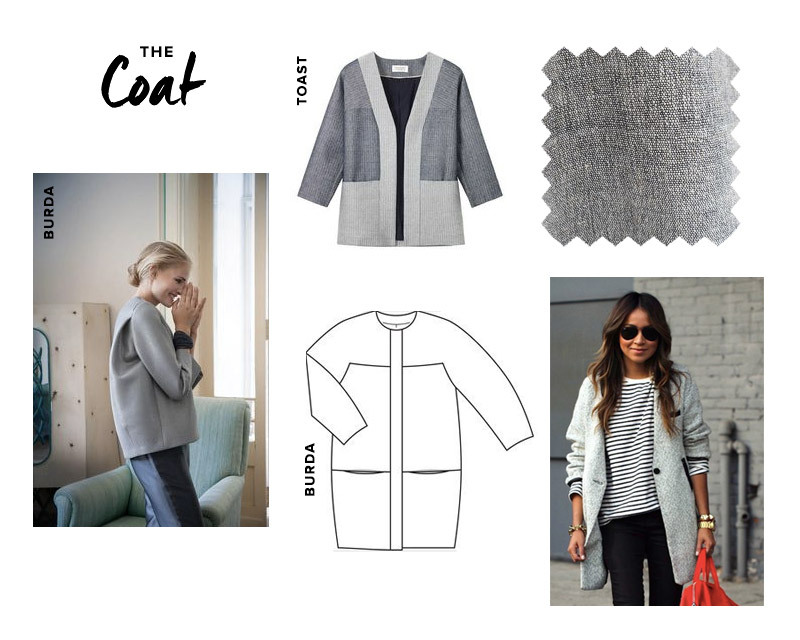 I just need to make a pattern decision and get started – coats are such a commitment…! Loving the capsule themes, just getting to grips with knit fabrics so also looking for some warm greys to practice new skills on. Also thinking about making my own dress for a wedding in November… need to decide on the look I’m assuming for really though. I have two weddings coming up so do need to think of frocks for those too! First I have to comment on the photo of you holding the bolts of fabrics – there is one happy woman! I think we (sewists) would all have that smile holding our favourite finds too! 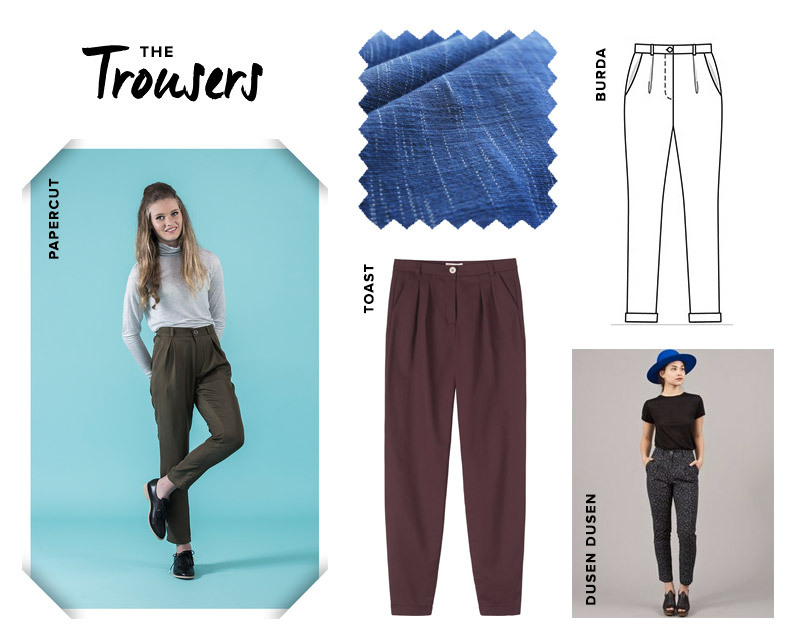 I like seeing your A/W sewing plans. I have been on a dress kick lately so I am intrigued by that Ace & Jig red dress and like that style. I will look forward to seeing what yours will look like, along with that coat! Ha ha, isn’t fabric shopping the best. I love that dress! Well fabric draping is fun too :) I’m totally useless with vintage shopping so I’m sure it evens out! Can’t wait to see how they all turn out! Looking forward to seeing your finished garments! Thanks for sharing about the fabric, too. It’s great to see stores embracing eco friendly fabrics. I’ll be visiting London in a few weeks, so I might have to stop by the Fabrications store! Hope you can make it – the store’s ethos is all about being sustainable and upcycling, so the Offset range fits in perfectly. I love your plans!! I’m excited to see how things turn out! Better find time to do it all before it gets really cold! Hi, your autumn sewing plans look great, as do those fabrics! 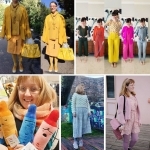 I just did a post on the longer Burda cocoon coat whose line drawing you’ve included in your idea board. It’s a really nice shape and I found it an easy enough, yet interesting sew. Can’t wait to see your finished projects, and thank you for some much-needed inspiration! Gosh it looks immaculate, beautiful job (and blog!). Thanks for sharing. I’m always amazed at what a great grip on your style you have! I love your pieces, and most of all I love how attainable your plan is :D I am working on my plan, and it has like 16 items on it (!!!!!! ), but at least a few of them are done already (like your top is according to instagram!). 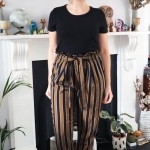 It’s also so great that you have access to such beautiful eco fabrics – I think that’s the next big step for me, but choice seems to be limited. 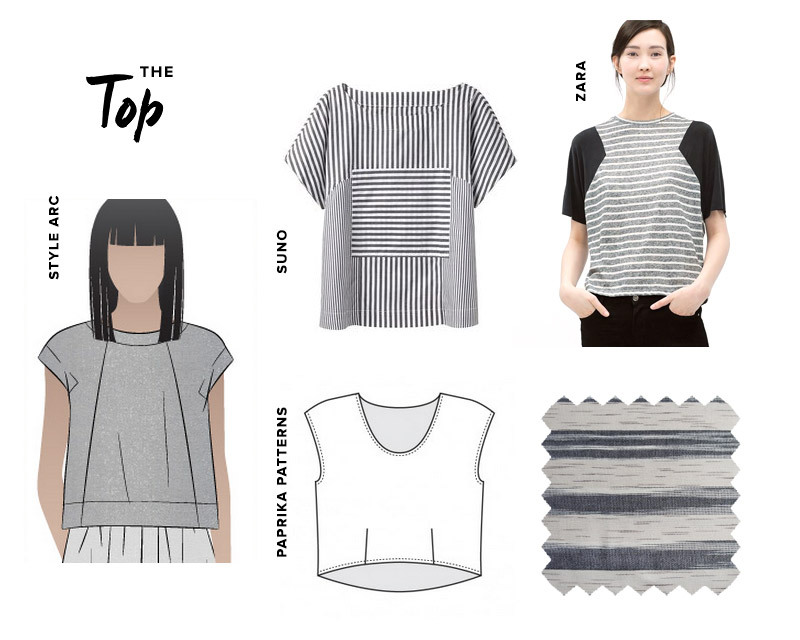 I’m feeling like I would rather focus on fewer garments and get them just right at the moment. Yeah I’m so glad the shop started stocking Offset – I had admired their site for ages but never took the plunge. It’s lovely to see them in person. What a great wardrobe!! I love all of those shapes. I will need to check out those patterns! I’m currently trying to wrangle all my ideas into some sort of plans that make sense for Fall. 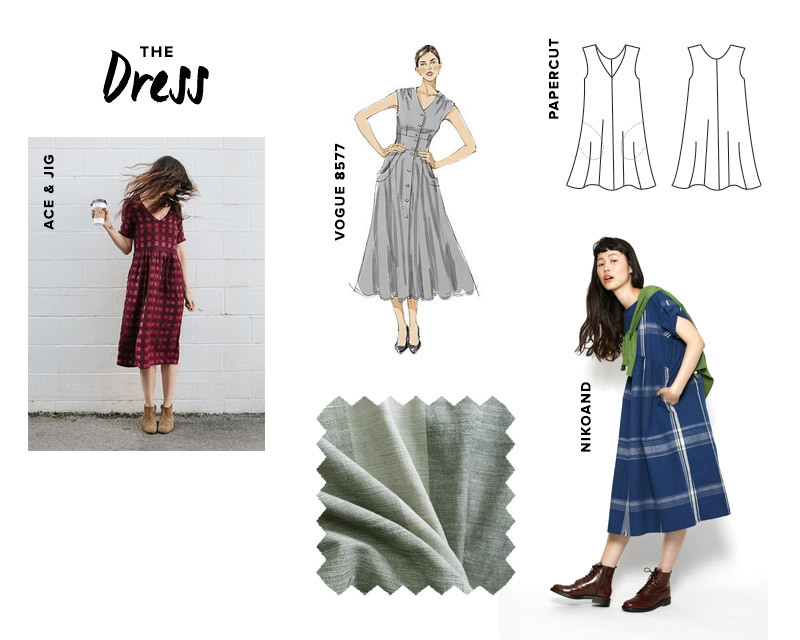 I’ve had that Vogue shirtdress on my list for a long time. I’d love to see how someone else makes it. I’m with you in that the end of summer leaves me feeling a bit sad and uninspired. But I’m enjoying your wardrobe plans and your beautiful sketches! Looking forward to seeing them come to life! Me too, better find some time! I absolutely love this! So creative and such good style. Thanks Jennifer, it was fun (and useful) to do!